Well, I'm not going to lie. It was really hard making this set. First trying to tie the Attribute and Type in a way. Especially since I use art. While you could argue that I don't need to use art, I INSIST on using art if possible. It makes it all the more pleasant to look at. I tried to tie in Continuous Spell Cards with the monsters. Even a small nod to the Xyz Monster in regards to your stance on Field Spells. 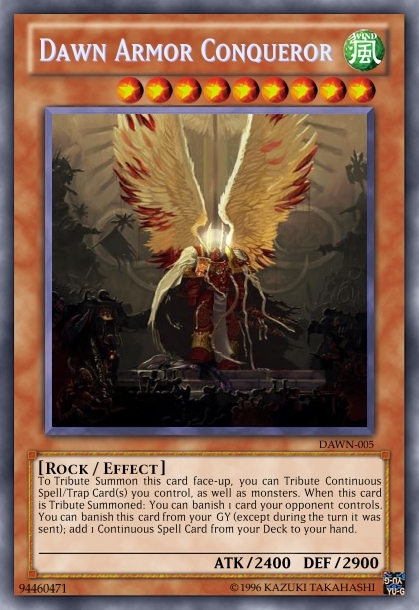 In any case, feel free to mention what Continuous Spell/Trap Cards (or cards in general) the archetype could use. As I do intend to continue it. In any case, Merry Christmas man. This card can attack twice during the Battle Phase. You can send 1 face-up Continuous Spell you control to the GY; Special Summon this card from your hand. If a Continuous Spell is activated (Quick Effect): You can increase this card's ATK and DEF by 800 until your next Standby Phase. You can only activate this effect of "Dawn Armor Duo" once per turn. If you control no monsters: You can Special Summon this card from your hand. Once per turn: You can send 1 Continuous Spell you control to the GY to target 1 card on the field; destroy it. 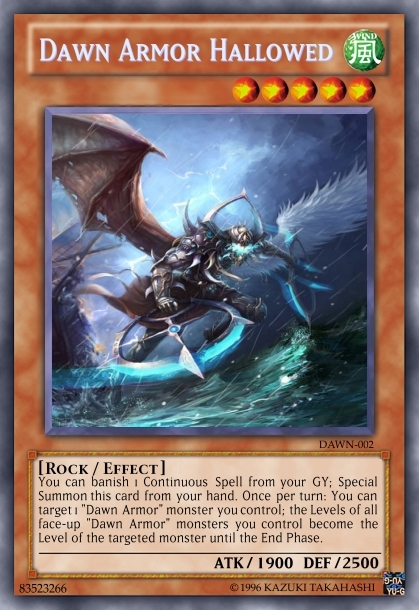 You can banish 1 Continuous Spell from your GY; Special Summon this card from your hand. Once per turn: You can target 1 "Dawn Armor" monster you control; the Levels of all face-up "Dawn Armor" monsters you control become the Level of the targeted monster until the End Phase. 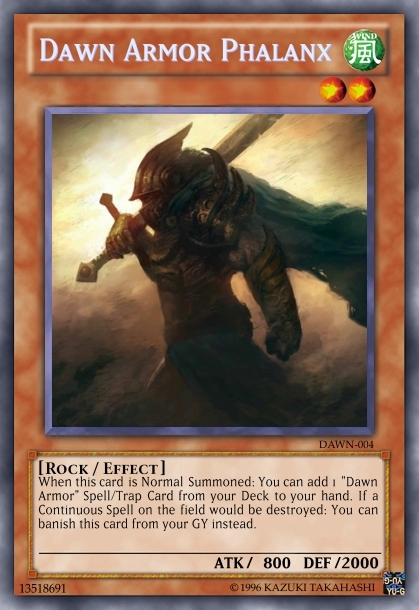 When this card is Normal Summoned: You can add 1 "Dawn Armor" Spell/Trap Card from your Deck to your hand. If a Continuous Spell on the field would be destroyed: You can banish this card from your GY instead. 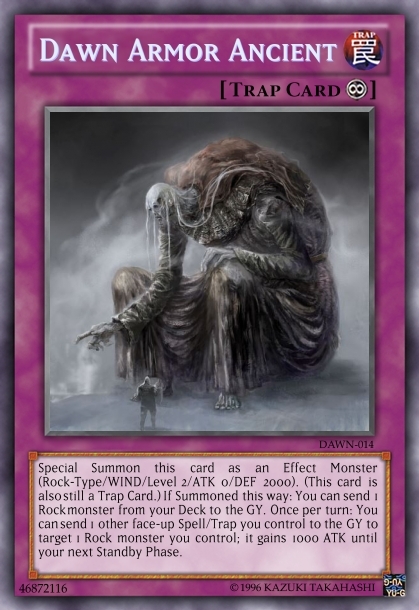 To Tribute Summon this card face-up, you can Tribute Continuous Spell/Trap Card(s) you control, as well as monsters. 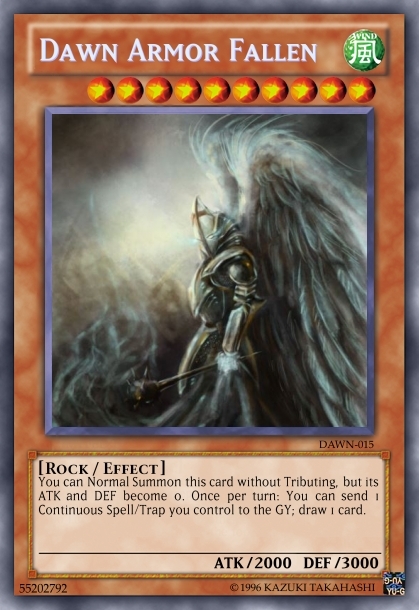 When this card is Tribute Summoned: You can banish 1 card your opponent controls. You can banish this card from your GY (except during the turn it was sent); add 1 Continuous Spell Card from your Deck to your hand. You can Special Summon this card from your hand. If you do: Send 2 face-up Spell/Trap Cards you control. Otherwise, destroy this card. Once per turn: You can shuffle 1 Continuous Spell that is banished or in your GY to target 1 monster your opponent controls; its ATK and DEF become 0. Cannot be Normal Summoned/Set. Must first be Special Summoned by its own effect. 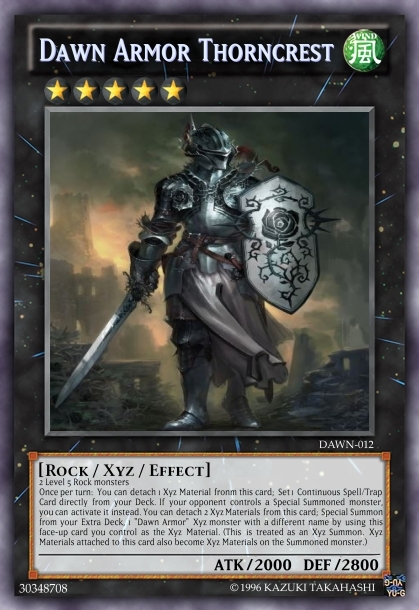 You can banish 3 "Dawn Armor" cards from your GY; Special Summon this card from your hand. If Summoned this way: You can send all monsters your opponent controls to the GY. If you do, your opponent takes no damage from battles involving this card. You can Normal Summon this card without Tributing, but its ATK and DEF become 0. Once per turn: You can send 1 Continuous Spell/Trap you control to the GY; draw 1 card. 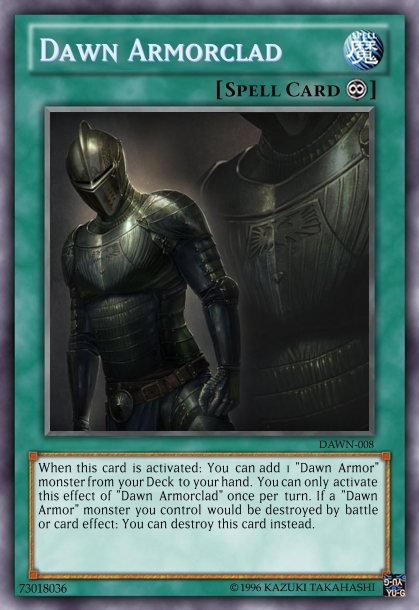 When this card is activated: You can add 1 "Dawn Armor" monster from your Deck to your hand. You can only activate this effect of "Dawn Armorclad" once per turn. 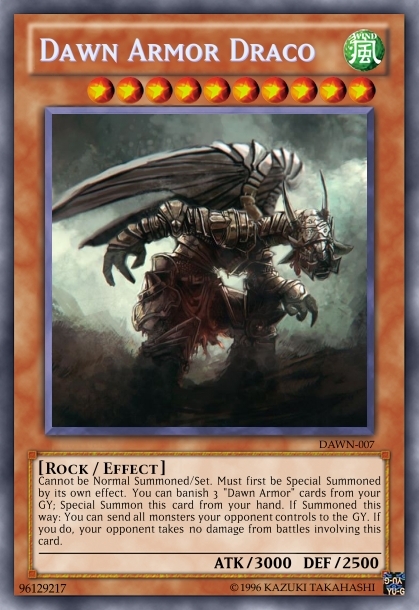 If a "Dawn Armor" monster you control would be destroyed by battle or card effect: You can destroy this card instead. If a Rock monster battles an opponent's monster: You can switch its ATK and DEF until the end of the Damage Step. 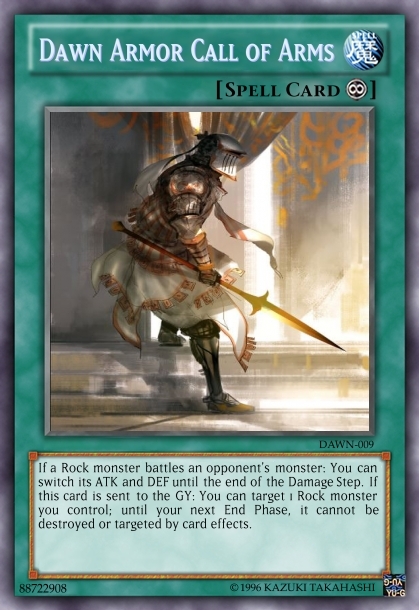 If this card is sent to the GY: You can target 1 Rock monster you control; until your next End Phase, it cannot be destroyed or targeted by card effects. Activate if you control no monsters. 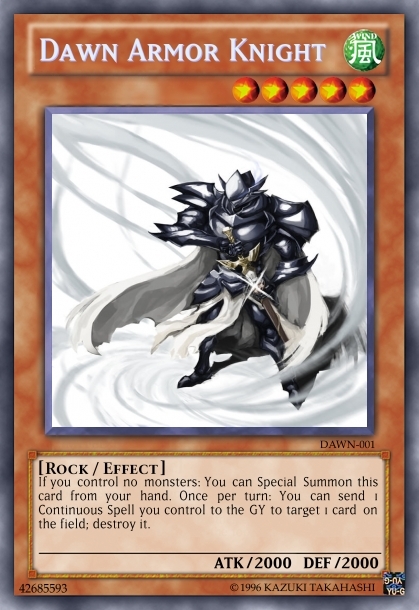 Special Summon 1 Rock monster from your Deck, but its ATK and DEF become 0 and its effect(s) are negated. 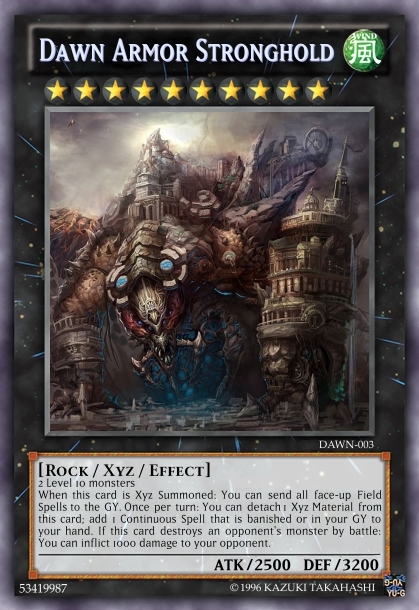 While you control a monster Summoned by this card, you cannot Special Summon monsters from your Extra Deck, except Rock monsters. 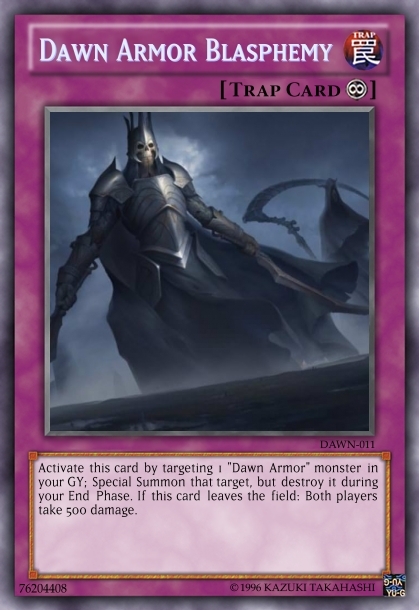 Activate this card by targeting 1 "Dawn Armor" monster in your GY; Special Summon that target, but destroy it during your End Phase. If this card leaves the field: Both players take 500 damage. 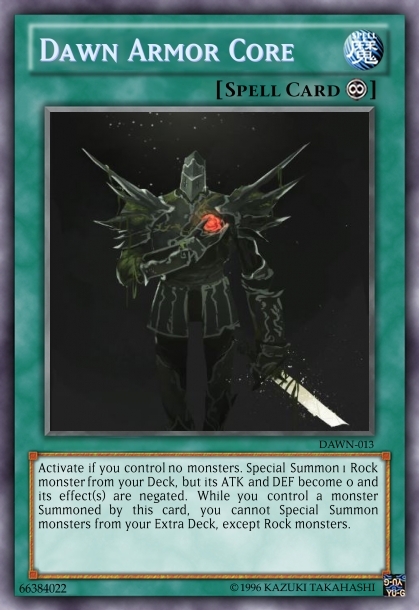 Special Summon this card as an Effect Monster (Rock-Type/WIND/Level 2/ATK 0/DEF 2000). (This card is also still a Trap Card.) 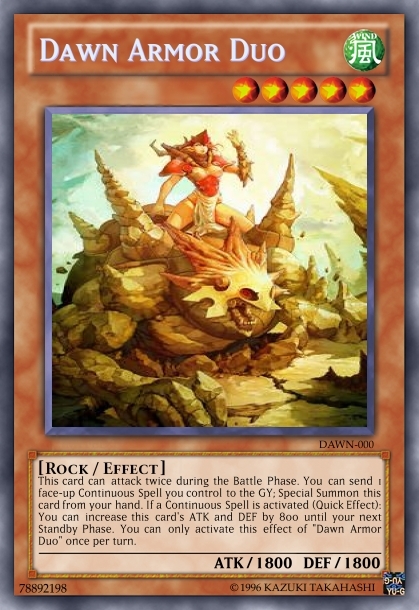 If Summoned this way: You can send 1 Rock monster from your Deck to the GY. Once per turn: You can send 1 other face-up Spell/Trap you control to the GY to target 1 Rock monster you control; it gains 1000 ATK until your next Standby Phase. When this card is Xyz Summoned: You can send all face-up Field Spells to the GY. Once per turn: You can detach 1 Xyz Material from this card; add 1 Continuous Spell that is banished or in your GY to your hand. If this card destroys an opponent's monster by battle: You can inflict 1000 damage to your opponent. Cannot be destroyed by battle. Your opponent takes any battle damage you would have taken from battles involving this card instead. Once per turn: You can detach 1 Xyz Material from this card; send 1 Continuous Spell from your Deck to the GY, and if you do, you can activate the effect of that Spell in your GY (even if you no longer control this face-up card). 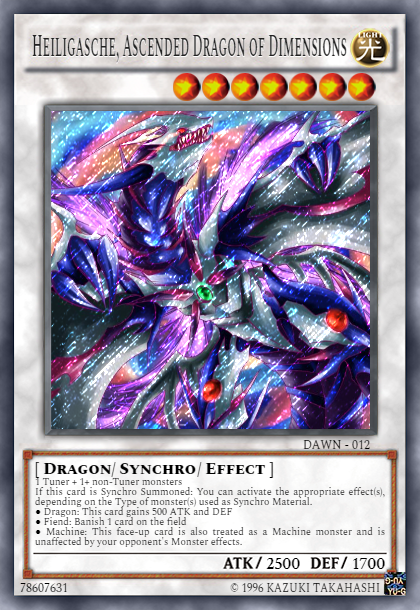 If this card is Synchro Summoned: You can activate the appropriate effect(s), depending on the Type of monster(s) used as Synchro Material. 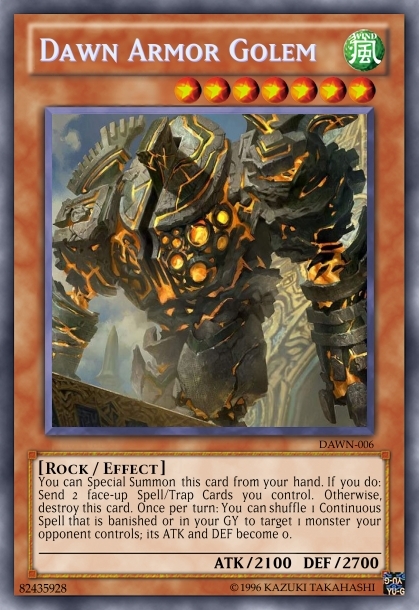 ● Machine: This face-up card is also treated as a Machine monster and is unaffected by your opponent's Monster effects. Added a gift for another member, and added on to the core archetype (two new Xyz Monsters, two more Spell/Trap Cards, and a new Main Deck monster. To easier bring out the Rank 10). "Once per turn: You can detach 1 Xyz Material fronm this card; Set 1 "Dawn Armor" Continuous Spell/Trap Card directly from your Deck." But I like the concept of the archetype as a whole. Well, its more of a balance suggestion than it is a typo. I made it generic because the materials required for the card are Rock monsters. 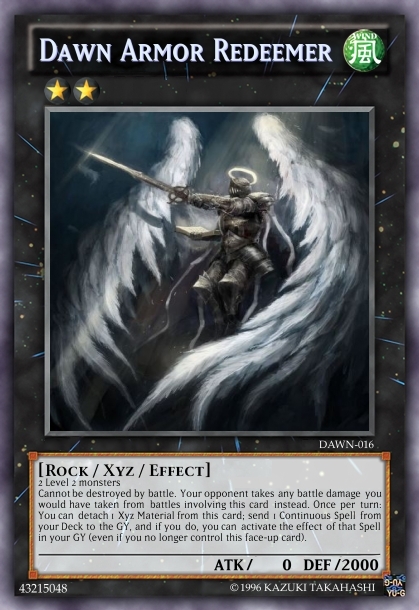 Very few Decks and archetypes can or would want to Xyz Summon this, so I thought it wouldn't hurt balance too much if it was generic.